My cousin Justin’s move to Melbourne gives me an opportunity to see the public transport network from the perspective of a brand new user. He’s pretty well travelled, having spent extensive time in Europe recently, mostly based in London, but with plenty of travel to other cities. So he’s used PT systems in many other cities. Secondly, at Moorabbin, where he was boarding, for some reason the Metcard validators are at the top of the ramp, but the Myki readers are at the bottom. 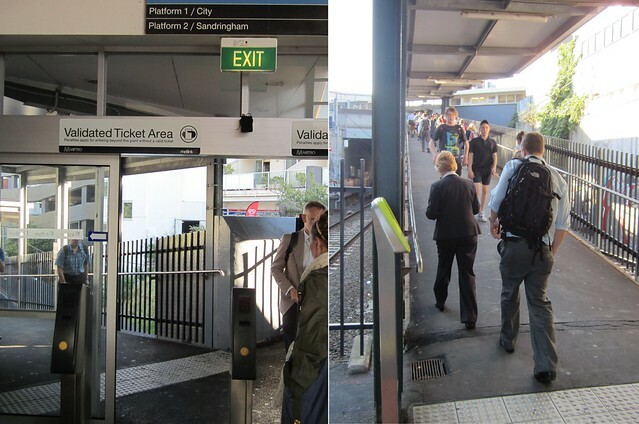 I noticed this is also the case at Elsternwick, where there are signs declaring the ramp to be within the paid ticket area: “Penalties apply for entering beyond this point without a valid ticket.” So are Myki users fare-evading for entering the ramp area, unable to touch-on until reaching the bottom? Eventually, with the help of a staff member, Justin sorted out where to touch-on. He reckons Myki is slower at touching than Oyster in London (which he used recently; he didn’t offer an opinion on Perth’s Smartrider.) I’m not surprised to hear that, given I thought Brisbane’s Go Card (which uses the same technology as Oyster) also seemed faster than Myki. Other than that, and some confusion over whether he needs to touch-off on trams, and precisely how the fares work, it seems to have been pretty smooth sailing. He’s working across town and was initially staying with my sister, and needed to change from the Frankston line to the Sydenham line. The question arose as to where he should change. In the mornings coming in on the Frankston line, he might end up on a Loop train, or a direct train. The conclusion was if a Loop train, change at Southern Cross, since in the morning Sydenham trains run via there. If a direct train into Flinders Street, he could change there. Okay. In the evenings, it’s a LOT more difficult. Thanks to the super-confusing Frankston timetable that operates on weekdays between 4 and 5pm, and also between 6 and 7pm, at times it’s best to go to Flinders Street, but sometimes it’s better to go to Southern Cross. It’s all got a lot easier now he’s moved onto the Epping South Morang/Hurstbridge lines. In the mornings, since those trains run clockwise via the Loop all day on weekdays, it’ll be easiest to change at Flinders Street. In the evenings it’ll be quickest to change at Southern Cross. Being on two lines (eg south of Clifton Hill) also means there’s little need for a timetable, since trains are pretty frequent all day everyday (though due to express running, there are some significant gaps around 7pm on weekdays outbound). He’s also close to a tram and the Hoddle Street Smartbuses. Justin’s noted that it can be quite confusing at times because some trains on the Frankston line don’t go all the way to Frankston. They are listed on the screens as trains to Mordialloc or Carrum, for instance. This is a serious issue, particularly at stations which don’t have screens listing all the stations served. In many cities the lines have a name that is independent from the terminii (think of London’s Piccadilly line, which terminates at Heathrow or Uxbridge in the west, and Cockfosters in the north/east, or the numbered lines used in cities such as Rome or Paris) — this is both a good and a bad thing. It relates to the readability of the rail map. Perhaps at the very least, the screens need to identify the Frankston line name even if the train doesn’t go all the way there. At least the screens on central station concourses do so. Overall he said it was all going well until last Friday, when his morning commute was interrupted by a disruption at Sunshine. He said there was no information provided to passengers on the outbound train. He only knew something was up when a lot of people boarded, apparently believing the train had been diverted to run back into the city. Eventually he discovered everybody was being kicked off the train, and he managed to find a bus that would take him the rest of the way to work. Conclusion: much of the time, if you can navigate the train network, it runs pretty well. But there are pitfalls for new users, and it can fall apart pretty rapidly when there’s a major disruption. Next → Next post: PSOs to check tickets, but won’t have #Myki readers? That won’t work. I would suspect that the myki FPDs are placed at the bottom of the ramp to avoid DDA issues with people queuing on the ramp when exiting in the peak. I did the same move (London to Melbourne) a couple of years ago, after never having lived here before; my experiences were much the same. The lack of information and poorly designed stations, and the random timetables really makes it a confusing and unwelcoming experience. Then you think you’re getting the hang of it, but as soon as you need to do something different to your normal commute, or something goes wrong, it’s back to square one. Living at Fairfield and explaining to out of towners how to get to my house can be confusing at times. “Get on either a Hurstbridge, Greensborough, or Eltham train, however if its an Eltham or Hurstbridge make sure its not an express, well actually it can be a limited express, but make sure its not an express past Clifton Hill.” That of course is the simplified version, the actual explinations to people out of town is always much more confusing. Usually I just end on go to a city loop station and ask for the next train to Fairfield. Interesting to read of your cousin’s experience Daniel. I really don’t understand why there are so many communication issues. When things do go wrong, communication is critical and can make a very big difference about how you handle the inconvenience etc. It is so often a bigger debacle than the actual problem. The only thing I can put it down to is a lack of focus on delivery of clear information which can only be driven by not understand the perspective and needs of commuters. Getting the communication right would make such a difference in these moments of abandonment! As another ex-Londoner, the thing I found the most confusing when I moved here was the city loop. In London you have the Circle line (much bigger, 27 stations, 23km when I left, now remodelled) which runs frequents trains from any station to any station in both directions. In Melbourne not only can you have to wait for extended periods at off-peak times – 20 mins on a Sunday night to go from FSS to SX if you time it badly, but some routes are just not possible whatever the map says, for example Parliament to SX in the afternoon – tram is your best bet, but by train you need to change at Richmond or North Melbourne. How on earth a tourist is meant to know this, I do not know. The other thing that could potentially confuse is the drafting of the map on the western side, with the 90 degree joins tending to suggest that the line ends here and you have to change. Yet the eastern side is clear, with 135 joins making it clear all the lines funnel in to the centre.